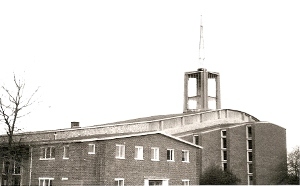 The church by H Braddock and D F Martin-Smith (ICBS/60 Churches p72) was opened in 1958. One of the more ambitious in the new town, it cost over £41,000. It combines church and hall under one curved concrete roof, rising to a peak over the church. At the highest point is a square tower, with a glazed lower part and an upper one of open ironwork. The side-walls are stepped out with windows in the ‘steps’. The exterior lacks unity, for the domestic-looking sides of the hall contrast uneasily with the main front of plate glass. The interior is more successful, for the hall and church are separate except on special occasions. The walls are of painted brick, white except for the blue east wall, pierced with small openings filled with coloured glass, and the ceiling is turquoise. The stepped out parts recall transepts. Most fittings are unremarkable, save perhaps for the curious lights which resemble nothing so much as tram-wires.